De Quervain’s tendonitis makes thumb movement painful. 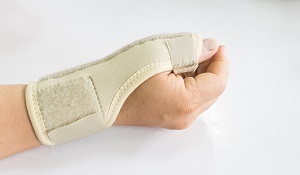 De Quervain’s tendonitis is painful inflammation that impacts the tendons of the thumb that connect it to the wrist. Once swollen, the tendons press against the tunnel they pass through, causing pain at the base of the thumb extending up to the arm. De Quervain’s makes thumb movement painful and difficult, making simple tasks such as picking something up hard to accomplish. It differs from patient to patient, at times appearing suddenly and for others coming on more gradually. Women are 20% more likely than men to experience de Quervain’s tendonitis. Some women experience this syndrome in the time immediately following pregnancy. Overuse seems to be one cause, particularly for those who make repeated grabbing motions in their day-to-day through activities such as gardening, certain work functions or sports injuries from tennis. Rheumatoid arthritis can also cause de Quervain’s. Pain and swelling at or near the base of the thumb are the most commonly felt symptoms of de Quervain’s. Many experience a type of sticking sensation in the thumb during attempts to move it. Prolonged use of the affected area often leads to the pain spreading throughout the thumb and arm. What are the treatments for de Quervain’s tendonitis? Cortisone injections are effective in the treatment of de Quervain’s. Your doctor may prescribe anti-inflammatory medication along with splinting and icing. Very rarely is surgery required, and only if the inflammation persists following more than one cortisone injection. If you’re experiencing pain at the base of your thumb and think you may be suffering from de Quervain’s tendonitis, make an appointment with our sports medicine doctor here at Spinal Rehab and Sports Medicine today at a time convenient for you. Dr. Bob Meyer has been practicing sports medicine for over 21 years. He goes beyond simple diagnosis by creating custom sports injury treatment plans for the needs of each patient.